Advanced Hardwood Biofuels Northwest is comprehensively evaluating poplar-based biofuel production, including economic sustainability aspects of the feedstock and biofuel supply system. Researchers at University of California at Davis are determining the most favorable locations and sizes of the biorefineries by considering all costs along the supply chain. The potential distribution of poplar supply throughout the Pacific Northwest including the location, size and expected yield of poplar bioenergy farms. The transportation and delivery infrastructure required, taking into account actual road, rail, and marine transit routes, as well as loading and unloading costs. The costs of transporting the biomass to the refinery, converting it to fuel, and transporting the biofuel to a fuel distributor. The price the market will pay for biofuel. Two types of land are of interest for poplar production in the Pacific Northwest: rangelands (grasslands and pasturelands) and croplands (lands currently producing crops). Forested lands are not considered due to economic, environmental, and policy constraints involved with conversion to poplar production. 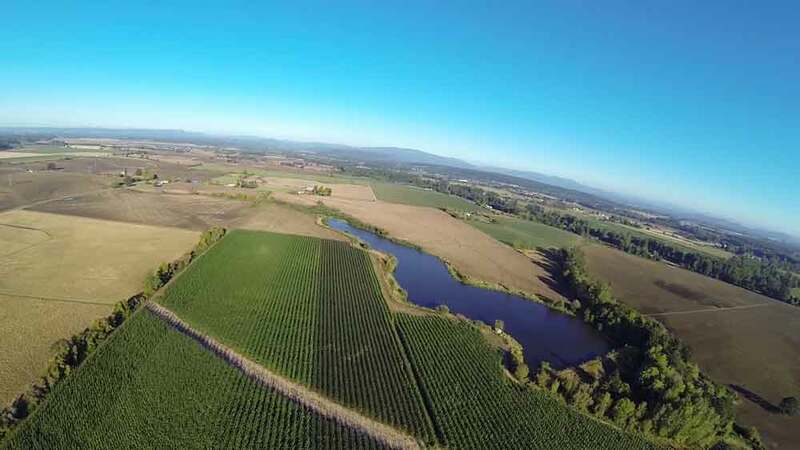 When restricting the poplar plantations to rangelands without irrigation, the best sites for biorefineries are in the Willamette Valley in Oregon and Puget Sound Lowlands in Washington. These regions have sufficient lands in rangeland and good yields for poplar. In California, low yields on non-irrigated lands and relatively dispersed rangelands lead to a significantly higher cost of production. On cropland, poplar will be in competition with existing crops for both land and water resources. An agricultural economic model of poplar crop adoption (Biomass Crop Adoption Model or BCAM) is used to predict how poplar will compete with existing crops. In general, croplands have higher land costs but also higher yields. In the most favorable regions, the economics of growing poplar on croplands are predicted to be similar to those for poplar grown on rangelands. 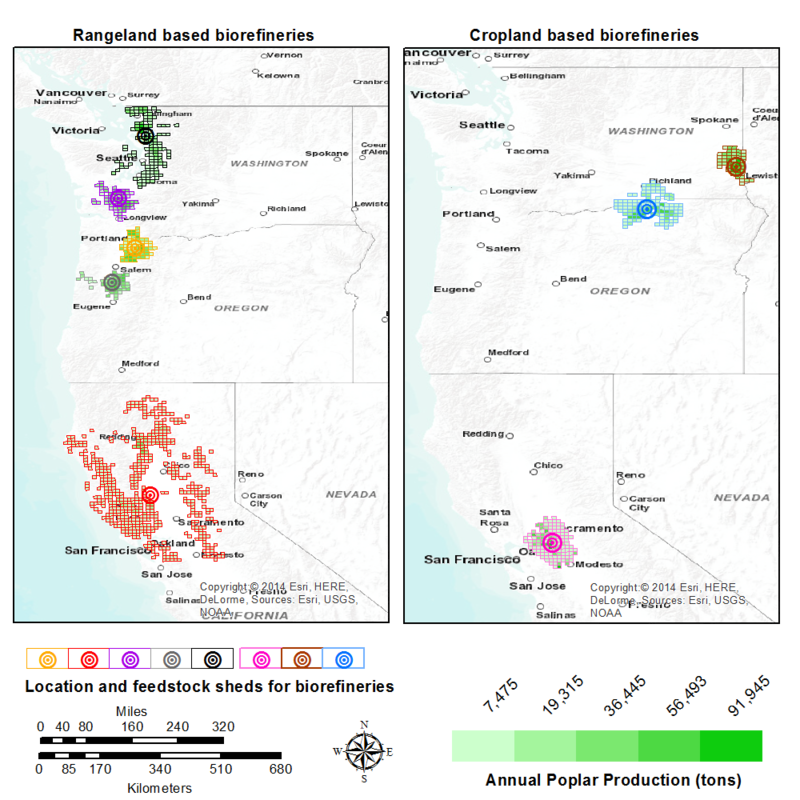 The lowest-cost region, near the Clarksburg, CA demonstration site, is characterized by high predicted yields under irrigated agriculture, which makes the feedstock competitive at relatively low poplar prices. Other attractive regions include southeastern Washington and northern Oregon where GreenWood Resources, Inc. currently has their large tree farm. Representative biorefinery locations for rangelands (left) and croplands (right). Feedstock source areas for each potential biorefinery are shown. The GBSM also helps to determine the optimal size of the biorefineries, which balances the trade-off between the economics associated with the conversion facility and the cost of biomass. For example, producing a gallon of fuel is cheaper in a100 million gallons per year (MGY) refinery compared to a 25 MGY refinery. However, a larger facility will have higher costs for feedstock due to the need to transport biomass long distances in order to effectively utilize the higher production capacity. Initial analysis suggests that larger biorefineries are more economically favorable. However, because larger biorefineries require greater capital investment, they may pose a higher financial risk. Therefore, initial biorefineries are expected to be smaller than optimal as found by the GBSM resulting in an increase in the cost of biofuel production on the order of $1/gallon. As the industry matures and efficiencies in production and biorefineries become larger, costs are anticipated to decline. In the meantime, we are exploring how co-products, supplemental feedstock sources, and other options can for improve the economics of small biorefineries.